Too bad our small-spaced home garden is unable to accommodate this enchanting and gorgeous Foxtail Palm, aptly named as its leaves or fronds are bushy and likened to the tail of a fox. 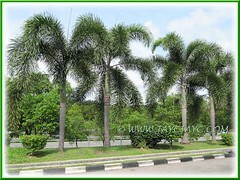 Fortunately, these spectacular palm trees with foxtail-like fronds have become an absolute craze among landscapers in our tropical country, Malaysia and we can still get to enjoy them even not planted in our garden. They’re grown almost at every nook and corner, especially along byways and highways, road dividers, roundabouts, and landscaping around shopping malls, hotels, parking areas and elsewhere. They are also popularly planted elsewhere around the world wherever there’s conducive and suitable conditions, even in the sub-tropics. Surprisingly that even though there are countless Wodyetia bifurcada growing worldwide, the Queensland Government still has it listed as an endangered species. Go for it if you have a bungalow or residential property that is surrounded with sufficient garden space. These appealing palm trees will be a grand and awesome display, especially when the duck-egg-sized, orange-red fruits adorn its trunk! You can either form an informal hedge for privacy, mark your property’s boundary and grown collectively as a group or single specimen. Common Name: Foxtail Palm, Wodyetia Palm. Etymology: The genus, Wodyetia is named after an Aboriginal man named Wodyeti who introduced it to botanists and the world’s attention in 1978.The species name, bifurcata, in Latin means twice forked, in reference to the shape of both the fish-tailed leaflets and the fruits. Origin: Tropical Australia (Cape Melville on Cape York, North Queensland). 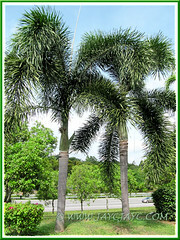 Plant type: An ornamental and evergreen perennial palm tree. Features: Wodyetia bifurcada is a charming species of the genus, Wodyetia and considered as one of the world’s most popular ornamental palms, especially great for landscaping. A medium stature, solitary, single-trunked, evergreen and perennial palm tree that grows upright.It develops slowly to about 10 m tall and has an arching crown with densely plumose foliage with a spread of about 1.52-3.05 m.
It very rarely reaches over 9.1 m (30 ft) in height. 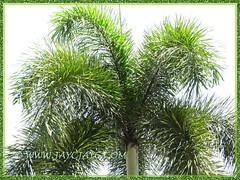 It’s easily maintained as the Foxtail Palm’s trunk is self-cleaning. The slender and dark grey to light grey trunk has traces of old leaf scars that are closely ringed around it. Below the canopy of fronds, you can see its smooth crown shaft, coloured light to bright green and slightly swollen at the base. Its emerging foliage are coloured light green and turn dark green when matured. The attractive arching fronds are bushy and have a bottlebrush or foxtail-like appearance, hence aptly named commonly as the Foxtail Palm. 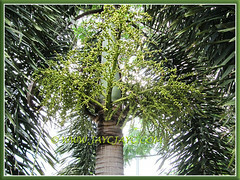 The matured palm will produce a canopy of 8-10 fronds. 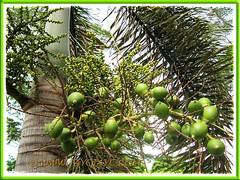 At the base of the crown shaft of a mature palm tree will emerge a whitish- or cream-coloured, thick stem bearing the inflorescences with white flowers that eventually develop into a cluster of fruits. The unripe fruits will start off olive green, then turn to green and subsequently ripen into large orange-red fruits, about the size of a duck egg. The ripened fruits present an appealing display! Each ripened fruit contains a single seed that can be used for propagation. Culture (Care): Wodyetia bifurcada or Foxtail Palm is a very hardy palm that grows easily and practically thrives on neglect. It is probably due to our tropical weather, with abundant rain, sunshine and humidity that makes it to flourish unattended. Light:Best in full sun though partial shade suits it fine too. Even young plants are able to tolerate the full sunlight. Moisture: Medium water requirements. Can tolerate strong winds, salt spray and is somewhat drought tolerant too. Soil: Prefers deep draining, sandy or sandy loam soils though can tolerate a wide variety of soil conditions. 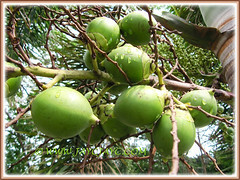 Others: If you prefer fast growth, water regularly and feed the palm once monthly with an organic based fertilizer. To maintain a pleasing appearance, remove the flowering stalks that are no longer fruiting and drooping withered fronds . It seldom attracts pests and disease, and lethal yellowing is a non-issue. For subtropical and temperate regions: Hardiness: USDA Zone 10-11. Though palm trees need protection from frost or freezing temperatures, it’s winter-hardy to -2.7°C (27°F) for mature and established trees that can thrive without much damage. Some gardeners in Zone 9 have successfully grown these palms outdoors with protection during winter. You need to water them regularly during the hot seasons but reduce watering during the cooler months. Propagation: By seeds germination which may take 1-2 months in 30°C conditions after sowing, while some may even take a year. 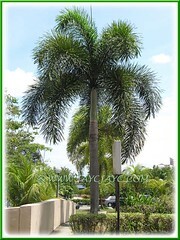 Usage: Popularly grown outdoors for landscape designs, the Foxtail Palm will add glamour to any surroundings. These palm trees with bushy and arching foxtail look-alike fronds would look great, especially adorning the byways and highways, road dividers and roundabouts. 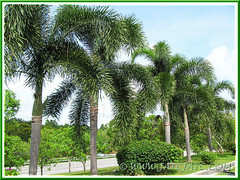 Fantastic too if use as a landscape design around residential and commercial sites, such as the shopping malls, hotels, parking areas and elsewhere.You can also locate it within the house compound as a single specimen or grown to line the sides of your driveway or collectively as a group at the corner of the house, to beautify your surrounding, making it impressive and interesting with a tropical look.It can also be planted in large pots or tubs to be located along the pool to shelter against the harsh rays of full sunlight. Can be placed indoors too as interior decor, given the right conditions of natural lighting and humidity. So glad to see you posting again, Jacqueline. Wish you well! 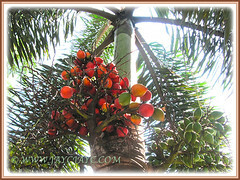 I had seen those fruits in hanging gracefully in a spike & very much desired to use them for decor. Its a factor of space and personally I’m not so fond of palms. I’m surprised to note of its endangered status as I seen them all too common as you mentioned here. @ Cheah: Thanks for dropping by to share your kind thoughts and well wishes. Due to my weakness, I’ll try to publish at least 2 articles a month for our valuable readers and site’s visitors. 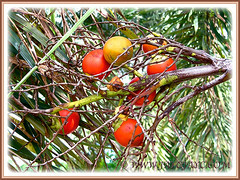 @ James: Unfortunately, we have never seen these lovely orange-red duck’s egg-sized fruits.. will be looking out for them to share in this post. We love palms though they tend to break some of the terra-cotta containers they’re housed in. Thanks for visit and sharing your thoughts. Hope to visit your lovely garden online when time permits. The scientific name is a mouthful to pronounce. They do remind me of fox tails. The leaves look nice on the tree but when they dry up and fall to the ground, it becomes an obstruction when not cleared up by the owners. Haha… you’re so right with the botanical name, A.Belle! Between John and I, we normally use common names for our garden plants as they’re more easily remembered.